I don’t know about you but it’s bake sale season in my world, with both our employers running United Way workplace fundraisers. Somewhere along the line I got pegged for butter tarts, and now I’m a bit of a November workplace baking celebrity. What is it about butter tarts and the Canadian identity? They aren’t really a thing in the US apparently, although the southern pecan pie is very similar — we just leave out the pecans. According to Wikipedia, butter tarts are a quintessentially Eastern Canadian dessert, and have their origins in pioneer Canadian cooking. There are festivals dedicated to them, and they’ve become a must-have cottage country staple. People are obsessed. 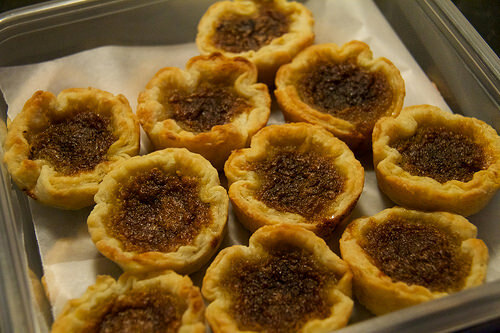 For me, butter tarts really started with my Mom, although I have to say she has her own recipe and I have mine. My Mom’s also been pegged as the butter tart queen in her circles, being threatened to be barred entry to gatherings unless she arrives bearing a few dozen. For my part, I get people trying to reserve them for the bake sale the night before, and others emailing me to confirm I’m making them. I’ve even been offered bribes. And then there’s the raisins or no raisins divide. My husband, who does not have a sweet tooth at all (damn him), makes an exception for butter tarts, and he is firmly in the “with raisins” camp. I have to ensure I make several extra for him or the bake sale supply will never get out of the house in tact. I make both kinds for the bake sales. My recipe is based on the Canadian Living magazine version with a couple tweaks. First, I don’t use their pastry recipe. I’ve got my own no fail pie crust that I use for everything, and I like it better. I thought I got it from Smitten Kitchen but I can’t find the recipe on her site now, so maybe I modified it and made it all my own at some point in my pie crust love affair. The important thing is I’m whole hog on the butter baby. No shortening for me. Secondly, I discovered by using an extra egg in the butter tart filling it becomes more stable during baking and less prone to boiling over into a sticky impossible caramelized mess that make the tarts difficult to remove from the tins. Adding the extra egg does not take away from the sweet, gooey awesomeness that is the heart of the tart. Let me tell you from experience that if you are indeed making these babies for a bake sale, borrow or buy some extra tart tins. Butter tart baking is messy business, and if you need to make at least 4 dozen like I do, washing the tins between baking is a serious drag. The filling that does manage to escape the pastry is literally caramel, and it hardens to the tin just like a hard candy — no stick coating or not. Save the washing up headache for the end and have a fresh tin for each dozen you’re going to pull off. I just bought a couple extra tins for this very reason; and there is really no other justification for me to own 4 sets of muffin/tart tins other than butter tart baking. And now for the much anticipated recipe sharing. Enjoy! In large bowl, whisk flour with salt and baking powder. Cut in butter with pastry cutter until mixture resembles coarse crumbs with a few larger pieces. Some people advocate using a food processor for this. I do not; I recommend using a hand-powered pastry cutter for the best results. Starting with a tablespoon at a time, sprinkle cold water over flour mixture, stirring until pastry holds together. DO NOT over hydrate the dough and DO NOT over mix. You can use your hands instead of a spoon as the dough gets harder to mix to help press the dough together but resist the urge to knead — this is not bread. You should be able to see bits of butter that are not blended into the dough; this is what makes the pastry flaky during baking. 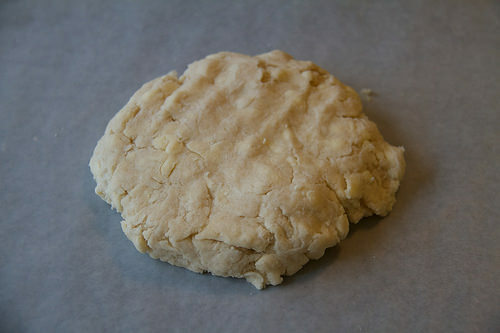 Once your dough is more or less holding together, press into disc shape (like the photo above) and wrap in waxed paper. Refrigerate until chilled, about 1 hour. Make-ahead and refrigerate for up to 3 days. Preheat your oven to 450 ºF (230 ºC) and move the rack to the lower third of the oven. For the filling, in a separate bowl, whisk together brown sugar, corn syrup, eggs, butter, vanilla, vinegar and salt until blended; set aside. On lightly floured surface, roll out pastry to 1/8-inch (3 mm) thickness. Using 4-inch (10 cm) round cookie cutter (or empty 28 oz/796 mL can), cut out 12 circles, re-rolling scraps once or twice if necessary. Note that overworked dough will turn out poorly. Fit into muffin cups. Divide raisins among shells if using. Spoon in filling until three-quarters full. Bake tarts in your pre-heated oven until the filling is puffed and bubbly and pastry is golden, about 12 minutes. Different metals of pans can affect cooking time so monitor your tarts closely to avoid scorching. Let the tin stand and cool on a rack for 1 minute. Run a metal spatula or thin knife around tarts to loosen; carefully lift the tarts and transfer to rack to cool. Note that timing is crucial here — if you leave the tarts in the tin cooling for too long, any filling that has boiled over will harden considerably and make extricating the tarts very difficult. Try using maple syrup instead of corn syrup. The tart filling will be a bit runnier but the flavour is lovely. Drizzle cooled tarts with melted chocolate, or add a few chocolate chips to the filling instead of raisins. Substitute walnuts or pecans for raisins in the filling.